Z Square 7, "Hell's Belle"
On the Army Air Force website, forum section, there are photo's on two pages for the Thomas Crew of Z-7. A couple of nice color pictures above showing damage to Z-7, 42-24680, "Hell's Belle", of the 881st Squadron, 500th Bomb Group, after the mission of 3 Dec 1944 against the Musashino Aircraft Engine Factory near Tokyo. Photos are courtesy of Lisle Neher, right gunner on the Sullivan crew, 881st. "With plenty of warning, the Japanese had assembled dozens of fighters at high altitude, by some reports as many as 70. They picked their time and dove down in their firing passes. 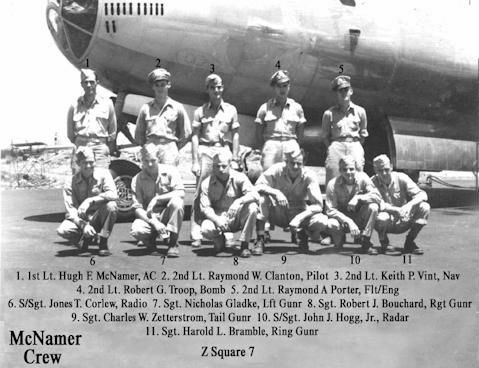 First to be hit was Z-7 (McNamer), "Hell's Belle", on the far right of the formation. She took a 20mm round below her nose which caused the bomb bay and wheel well doors to open and the landing gear to come down. The drag slowed the plane immediately and she began to drop behind. Smelling blood, enemy fighters closed in. The crew was able to get the landing gear back up but the doors would not close, and the bombardier was unable to salvo the bombs. All the while this was going on, the fighters were shooting Z-7 full of holes. "Not so lucky were the crew of Z-1. As the plane was going down, airplane commander Goldsworthy gave the order to bail out and strained to hold the big bomber level to give his crew time to get out. But there was a problem up front. stationed was fully afire and the fire was spreading forward. With “flames licking at the seat of my pants,” Goldsworthy finally gave up the controls, dragged Patykula to the exit hatch and pushed him out, then jumped out himself. deliberate choice on Edwards' part, as he had vowed to his family that he would not bail out over enemy territory. "Two of the men in the rear of the plane also apparently did not make it out. Ring gunner Abel had been wounded. Nobody knew what happened to the tail gunner, Corrigan; the interphone system had been shot up and there was no contact with him. But neither man was seen on the ground. Left Gunner Schroeder, right gunner Goffery and radar operator Wells did make it to the ground, although Wells was injured. parachute. So he fell free for what he estimated to be about 15,000 feet before pulling the ripcord. As he did so, he wondered if his chute would burn up like Patykula's... but it opened all right and he drifted safely to earth." And so Bob Goldsworthy fell into the hell of Japanese captivity. More about that later. Most of the story of the downing of Z-1 that you just read above came directly from Goldsworthy, who is still very much alive. A few more comments on the pictures of Z-7. In the second photo you can clearly see the collapsed nose wheel. The gear pushed straight up thru the nose wheel hatch. Lucky nobody was sitting on it. Also notice the bent propeller tips where they hit the runway. "Hell's Belle", of the 882nd Squadron and fly many more missions. Gunner Nicolas Gladke, front row-2nd from left, #7. 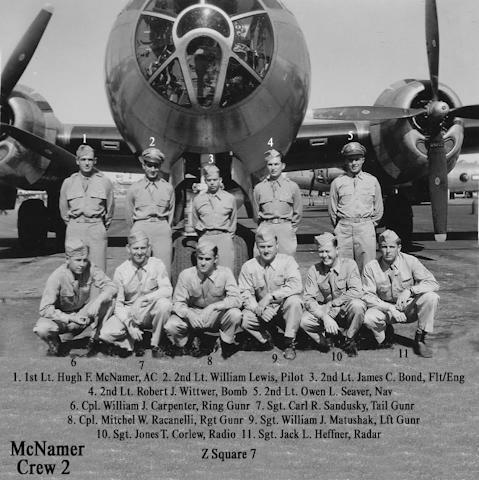 He was assigned to the McNamer crew after Lts. Engle and Pavey were KIA in the crash of the "Draggin Lady" and that crew was dispersed to other aircraft.